Currey Nobles and Travis Tennent recently placed first and second in the University Division of the 2016 American Association of Meat Processors, American Cured Meat Championship, held July 21-13 in Omaha, NE. Read the full article. 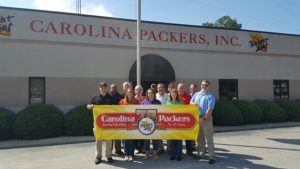 On June 24, 1941 John A Jones Sr. and several local businessmen formed Carolina Packers Incorporated. From the very beginning Carolina Packers created a much needed livestock market for Smithfield area farmers, many of whom became charter stockholders in the company. The company was not only an asset to area farmers, but to the overall economy; it was the first plant of its kind in all of NC and provided much needed jobs for Johnston County residents. June 2016 | Big news for food entrepreneurs seeking variances for cured meats! Dr. Dana Hanson (center) shares a special high quaility brand of Paprika with campers during BBQ Camp at NC State. “This is really like going back to school, not like some cooking class,” one participant said of the NC State BBQ Camp. Indeed, the event proved that what makes barbecue delicious is far more than firing up the grill. Hosted by NC State University’s Department of Food, Bioprocessing and Nutrition Sciences and the North Carolina Meat Processor’s Association, the two-day seminar was the first public offering of a university-level, science-based class in the Southeast. To prepare for the event, the two groups conducted a test camp in 2015 and several shorter sessions for North Carolina 4-H members.